What you will find in the following pages isn’t the average kitchen faucet review site. Since I work in the kitchen remodeling (and design) industry, I decided to pass on some information about the kitchen faucets I’ve come across during the course of an average working day. I’ve also added a few I’ve researched myself (just for good measure). What I have tried to create is a place on the internet where the average person can sit back and enjoy looking for a new kitchen faucet without being hassled with (what I even find very annoying) pop-ups. 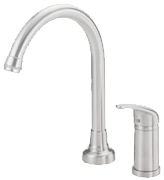 This is because I understand that choosing a faucet for your kitchen isn’t easy as it may seem, and is a decision you should take your time with. Along the way, you will find all sorts of different models and brands to choose from but I haven’t left you hanging. If you’re not sure about a particular type of faucet I’ve taken the liberty of adding a few information pages to help you make your mind up. Although I have made that possible for you, I have also thought about the fact that you may just still be at the research stage, so feel free to read up on some of the advice I’ve included here as well. I hope you enjoy my creation and even if you’re not ready to buy a kitchen faucet yet, you at least come away with more information than you had before you paid my site a visit – Enjoy!